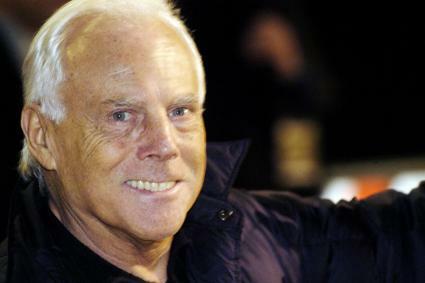 Giorgio Armani, one of the most authoritative names in Italian ready-to-wear design, was born in Piacenza, Italy, in 1934. He became interested in fashion in 1957, when he left the school of medicine at the University of Piacenza to become a buyer for the La Rinascete chain in Milan. In 1964 Armani met Nino Cerruti, owner of Hitman, the Italian men's clothing producer. After a brief period to see how Armani worked with materials, Cerruti asked him to restructure completely the company's approach to clothing. Armani worked with Cerruti for six years, developing a simplified form of menswear that could be reproduced in series. In the late 1960s Armani met Sergio Galeotti, which was the beginning of a relationship that lasted for years. In 1973 Galeotti persuaded him to open a design office in Milan, at 37 corso Venezia. This led to a period of extensive collaboration, during which Armani worked as a freelance designer for a number of fashion houses, including Allegri, Bagutta, Hilton, Sicons, Gibò, Montedoro, and Tendresse. The international press was quick to acknowledge Armani's importance following the runway shows at the Sala Bianca in the Pitti Palace in Florence. The experience provided Armani with an opportunity to develop his own style in new ways. He was now ready to devote his energy to his own label, and in 1975 he founded Giorgio Armani Spa in Milan with his friend Galeotti. In October of that same year he presented his first collection of men's ready-to-wear for spring and summer 1976 under his own name. He also produced a women's line for the same season. The secret of Armani's great success seems to derive from his having introduced, at the right moment, a new approach to clothing design that reflected the changes in post-1968 society, which was composed essentially of a middle class that could no longer afford to wear couture clothing but at the same time wanted to construct a distinctive image for itself. With this in mind, Armani established an innovative relationship with industry, characterized by the 1978 agreement with Gruppo finanzario Tessile (GFT), which made it possible to produce luxury ready-to-wear in a manufacturing environment under the attentive supervision of the company's designer. In 1979, after founding the Giorgio Armani Corporation, Armani began producing for the United States and introduced the Mani line for men and women. The label became one of the leading names in international fashion with the introduction of several new product lines, including G. A. Le Collezioni, and Giorgio Armani Underwear and Swimwear, and Giorgio Armani Accessories. In the early 1980s the company signed an important agreement with L'Oréal to create perfumes and introduced the Armani Junior, Armani Jeans, and Emporio Armani lines, followed in 1982 by the introduction of Emporio Underwear, Swimwear, and Accessories. 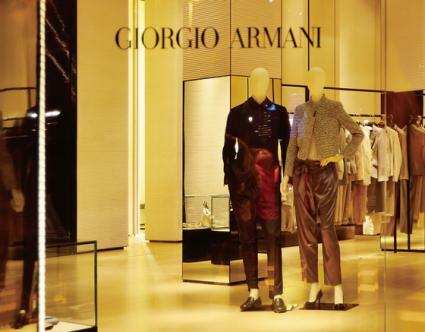 A new store was opened in Milan for the Emporio line, followed by the first Giorgio Armani boutique. Armani's concern for the end user culminated in the development of a more youthful product with the same level of stylistic quality as his high-end line, but at a more accessible price. In 1983 the designer modified his agreement with GFT. They began to produce both the Mani line for the United States and his high-end ready-to-wear line, rechristened Borgonuovo 21, after the address of the company's headquarters. During the late 1980s, despite Galeotti's death (1985), Armani continued to expand commercial horizons and licensing agreements. He opened Armani Japan and introduced a line of eyeglasses (1988), socks (1987), a gift collection (1989), and a new "basic" men's and women's line for America known as A/X Armani Exchange (1991). After the frenetic expansion of the 1990s (sportswear, eyeglasses, cosmetics, home, and new accessories collections), the year 2000, the twenty-fifth anniversary of the brand, saw a flurry of investment activity, including stock sales and the acquisition of new manufacturing capacity intended to increase Armani's control over the quality and distribution of his products. There is a common thread running through Armani's stylistic development that is closely associated with the change in contemporary society. It led to the creation of clothing and accessories that aimed at a clean, simple style, beyond fashion, designed to enhance the personality of the person who wore it. When, in 1976, the designer presented the first unstructured jackets for men, unlined and unironed, the product of years of experience in production design, they were intended to lower labor costs and simplify tailoring. But in introducing them Armani opened a third way in men's clothing, an alternative to the traditional approach of English tailoring and the expectations associated with Italian made-to-measure clothing, realizing an innovative synthesis between formal wear and loose, flexible sportswear. With the invention of the blazer worn as a pullover, Armani offered men a new identity that rejected rigid professional divisions and allowed them to present themselves as young, attractive, and vaguely feminine. Referred to as the "first postmodern designer," by several Italian newspapers, for his radically unstructured garments, Armani had simply softened men's wear and made women's wear more concise and modern, transforming changing social roles into an "Armani look," making the casual look authoritative. Official recognition of his fame came in 1982 when he appeared on the cover of Time magazine, only the second fashion designer, after Christian Dior, to do so. Armani had freed women from their stiff suits, providing them with soft jackets without collars and with comfortable pants. Although initially somewhat severe, as if intended to assist women in their climb to professional credibility, these outfits greatly enhanced a type of femininity that, because it was not ostentatious, was ultimately more real. Armani sought to establish an image of a woman who was strong but not harsh (a mix of the film stars Greta Garbo and Marlene Dietrich in modern dress) and who could be practical and indispensable as well as glamorous. Over time the jacket has continued to remain the centerpiece of the Armani wardrobe, changing year by year through the use of new materials, new proportions, and new colors. For Armani the "greige" (somewhere between gray and beige) of 1997 remained the most typical element in a palette often centered on shades of white and black, soft earth tones, dusty blues, and occasional unexpected bursts of color. The search for fabrics has always been one of the distinctive elements of Armani's collections for men and women, becoming a key design element in 1986, together with embroidery and the return to evening wear that he brought about. Here the look was precious and exclusive but always in a minimalist key, demystified through the use of low-heeled shoes or sneakers. An attentive analyst of past cultures and Eastern influences, Armani's clothing has never been a collage of banal ideas. Throughout his career he has always succeeded in providing new images of how men and women dress and in translating elegant, decorative patterns into a unique but accessible style. See also Film and Fashion; Italian Fashion; Jacket; Ready-To-Wear; Sports Jacket. Bianchino, Gloria, and Arturo Carlo Quintavalle. Moda: Dalla fiaba al design italia 1951-1989. Novara, Italy: De Agostini, 1989. Bucci, Ampelio. Moda a Milano: Stile e impresa nella città che cambia. Milan: Abitare Segesta, 2002. Celant, Germano, and Harold Koda, eds. Giorgio Armani. New York: Guggenheim Museum Publications, 2000. Sollazzo, Lucia. "Giorgio Armani." In Dizionario della moda. Edited by Guido Vergani. Milan: Baldini and Castoldi, 1999. White, Nicola. Giorgio Armani. London: Carlton, 2000.